Today's students are connected: they use communications, media, and digital technologies easily and thus their worldview is different from that of previous generations. As learners, they need both new and traditional skills. The good news is that schools have technology enhanced tools and methods to help them change the system and improve student achievement. 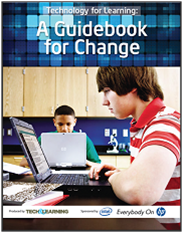 This guidebook provides a process for creating effective, robust technology initiatives based on real-life practitioners' successes. It is based on the complex confluence of variables that impact today's schools. It is designed to help you get started with the process.